Hydrogen ion is recommended by IUPAC as a general term for all ions of hydrogen and its isotopes. Depending on the charge of the ion, there are two types: positively charged ions and negatively charged ions. The ions produced by the reaction of these cations with water, as well as their hydrates, are also called 'hydrogen ions'. In connection with acids, "hydrogen ions" usually refers to hydrons. 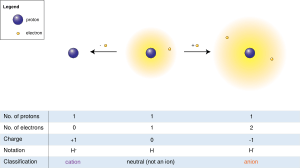 Hydrogen ion Facts for Kids. Kiddle Encyclopedia.